We didn’t see as many films in September as usual, but that’s not to say there wasn’t some excellent ones hidden in there. Here’s our three favourites! The stunning ‘45 Years‘ presents a happy elderly couple who receive a piece of news that forces them to reevaluate their relationship. 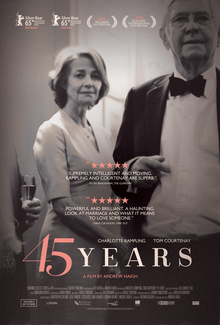 Phenomenal lead performances from Tom Courtenay and Charlotte Rampling bring this superbly written drama to life. An Estonian anti-war parable, ‘Tangerines‘ is infused with an immense sense of tragedy from the outset as a couple of men stay behind in their village to package and sell tangerines as war wages around them. A powerful and moving tale. A film to make you laugh and cry, ‘Me and Earl and the Dying Girl‘ rises above other coming of age films with an affecting story and excellent direction to tell a winningly unique story.